Tile floors are beautiful, durable, and a fairly DIY friendly option, but for tile’s good looks to really last, it’s vital to start with what you can’t see—the ideal underlayment. Both ceramic and porcelain tiles are hard and rigid, so if they’re installed on a surface that bounces or isn’t flat, they can easily crack, ruining all your hard work and leaving you with an unsightly floor. Read on to learn how to choose the best underlayment for your floor tile project. A tile floor consists of three individual layers: the subfloor, the underlayment, and the surface tile you walk on. There are various types of tile underlayment, but all serve to smooth out uneven spots in a subfloor and create an unbending layer that prevents the floor from flexing underfoot. (Without one, even slight movement of a subfloor can cause grout lines to crumble and tiles to crack.) Good underlayment also provides a waterproof barrier between the tile and the subfloor. membranes that come in flexible sheets. This is the industry standard most preferred by construction pros when installing ceramic or porcelain tile. Backer board comes in four-foot-by-eight-foot and three-foot-by-five-foot rigid panels that contain a combination of cement, fiberglass, and sometimes crushed glass particles. Pros install backer board on top of a layer of thinset (an adhesive), a process called bedding. The backer board is then secured with screws to the subfloor beneath. An additional layer of thinset is then applied to the surface of the backer board and used to set the tiles. 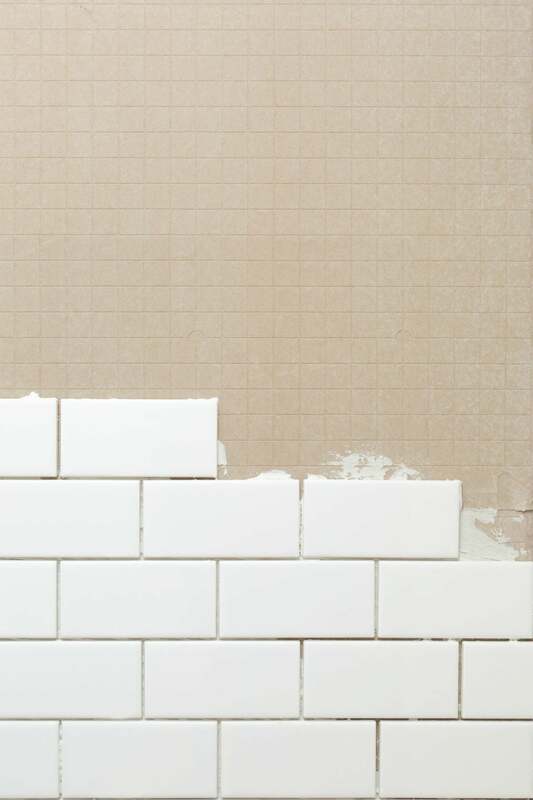 This is a very effective way of installing tile and the best way to ensure it doesn’t crack. Pro Tip: Use a concrete blade in your circular saw when cutting backer board; blades used to cut wood are not designed to cut through the cementitious panels. A number of trowel-able and pourable tile underlayment options are available, each with its own purpose and best use. Creating a bed of mortar is an older method of setting tiles on a concrete slab. It involves mixing dry mortar with water to a semi-solid consistency before spreading it smoothly over the slab to form a thick substrate that’s one to two inches thick. When professionally installed, mortar beds make good substrates for tile, but applying them evenly requires a high level of skill and many of today’s tile setters no longer use this method. Pro Tip: DIYers should steer clear of mortar beds, opting instead for backer board or one of the other types of tile underlayment discussed below. Thinset, though often called “thinset mortar,” should not be confused with regular mortar. Thinset is made from cement and contains polymers and adhesive agents that bond tightly with tiles. Thinset comes as a powder and must be mixed with water. It’s applied with a notched trowel to the surface of the backer board or to a concrete slab. 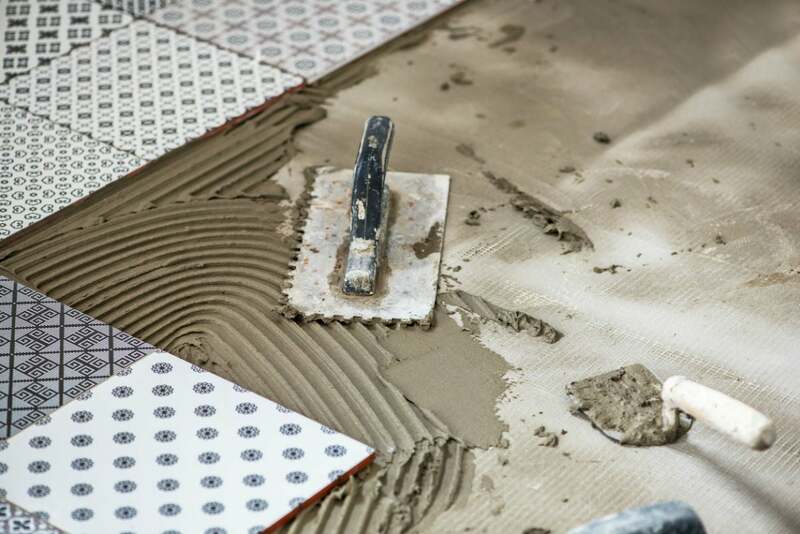 As long as a concrete slab is very flat and contains no cracks, tile can be installed directly on top, using thinset as the adhesive, allowing you to skip the backer board layer. If the slab is uneven or cracked, it must first be patched and leveled before tile can be installed. Pro Tip: To develop its adhesive properties, thinset must “slake”—allowing the mixed thinset to rest for about 10 minutes before remixing for use. If you don’t allow the mixture to slake, it won’t stick to tiles or backer board. Slaking time may vary by brand so be sure to read and follow the manufacturer’s instructions. Pourable self-leveling products help to flatten and level a wood subfloor or a concrete slab before the tile is installed. The dry product is mixed with water to a liquid consistency and poured on, then spread evenly with large push-type trowels or rollers. Because it’s a liquid, the product seeks its own level in low areas and evens out the surface of the floor. 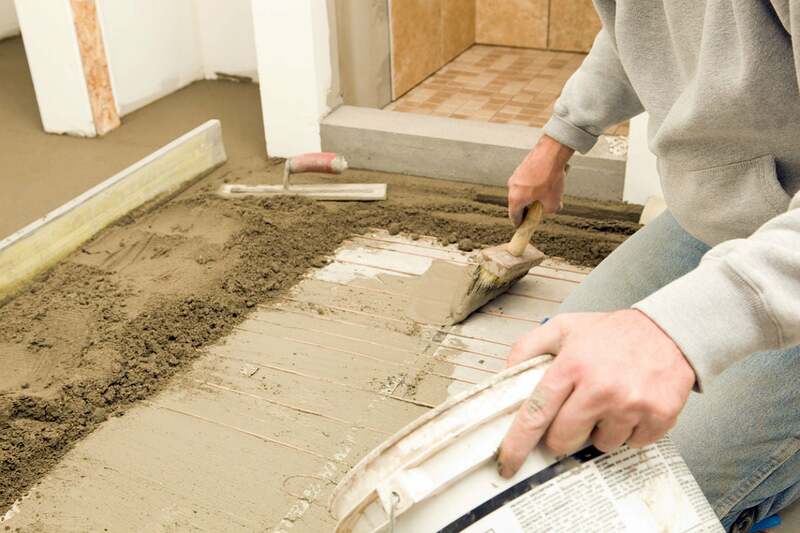 The compound must be allowed to dry completely before proceeding with tile installation, which can be anywhere from 24 hours to a few days, depending on the brand. Pro Tip: Tape over holes and cracks in the wood subfloor or slab before pouring on the self-leveling tile underlayment to keep it from seeping through and leaving indentations. Flexible, polyethylene underlayment membranes come in rolls and are designed to add a measure of protection from water as well as from cracking (depending on the specific product). They’re used in place of backer board but install in a similar way. Waterproofing membranes, such as KERDI, manufactured by Shulter Systems, are DIY-friendly and can be cut to fit with a utility knife. They’re typically used as underlayment in tile showers to prevent water from leaking through cracks in the concrete shower base. The membrane installs over a layer of thinset and additional thinset is used to affix the tiles. Pro Tip: The seams where two membranes meet should be sealed only with the tape or sealant recommended by the manufacturer. Not all sealants are compatible with all brands of membranes. Uncoupling membranes, such as DITRA, also manufactured by Shulter Systems, take the place of traditional backer board on wood subfloors and concrete slabs. They’re designed to absorb imperceptible amounts of substrate movement and keep tiles from cracking, hence the term “uncoupling,” because the surface tiles are uncoupled from the movement of the substrate. Like backer board, uncoupling membranes are embedded in a layer of thinset, and then another layer of thinset is applied on top to affix the tiles. 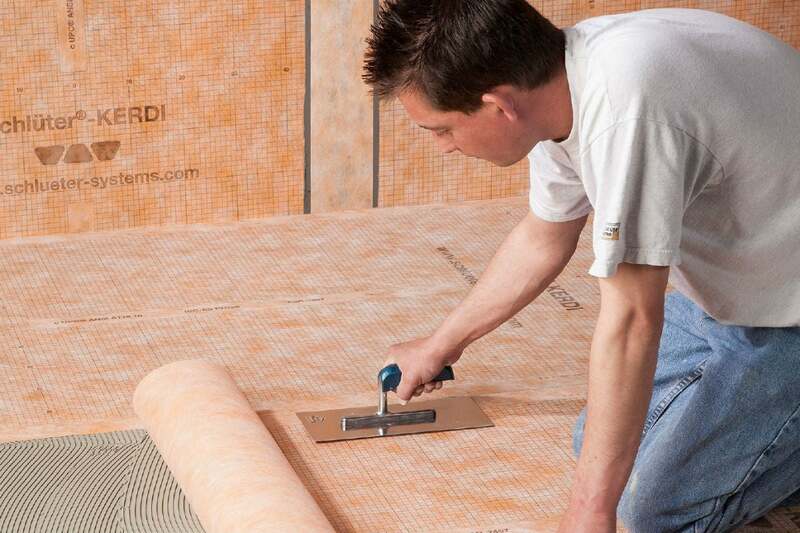 Pro Tip: While uncoupling membranes are easy to use, they do not add a layer of rigidity to the floor like backer board does, so they should only be installed on very stable floors. Before installing, read carefully through the installation instructions to determine whether your joists and subfloor are suitable for this type of tile underlayment. The membrane manufacturer will specify the minimum size of floor joists and joist spacing required in order to support the tile surface.